Hong Kong but not sure it's in China. 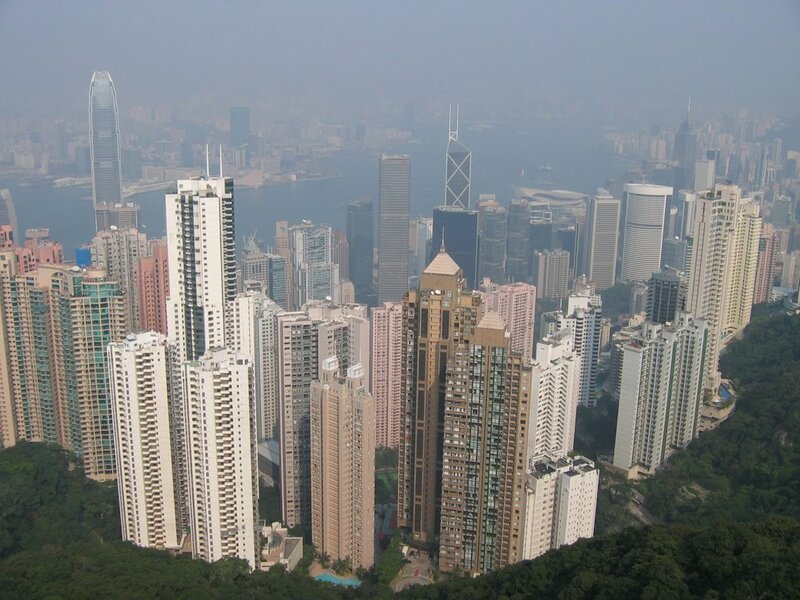 What is impressive when you arrive in HK like people say around (what is KL? ), is the fact that you feel being part a different city. First of all it's a city with the sea around, or an island it's up to you. A city with the sea .... plus it's a big city !!! It's a mix between West and East. 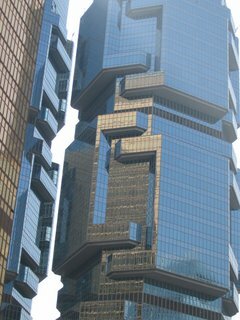 It seems that it used to be very western before, but the Chinese side is starting to take over, rather than Singapore is doing the opposite. 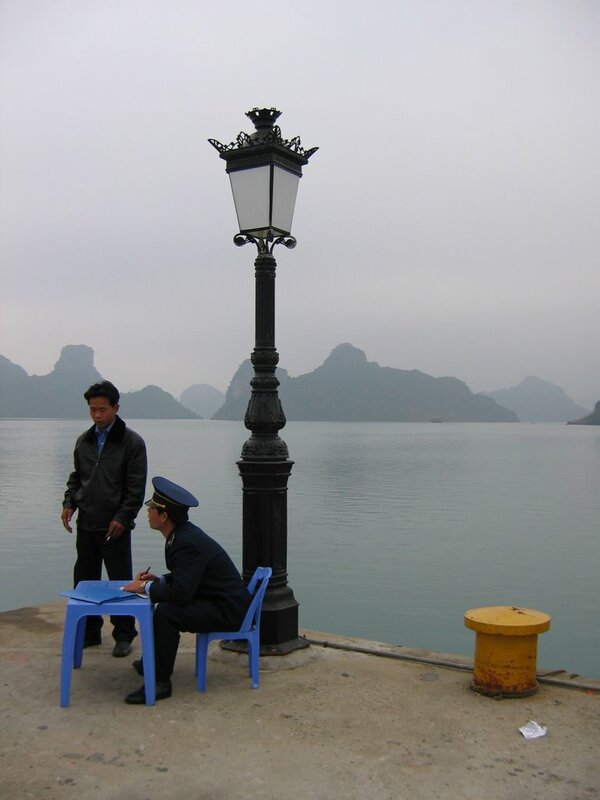 For me it's a spot that one has to stop to if really interested in Asia, and its cultures. This city rocks for its resturant over looking the bay, bars full of music as trendy as any other bars in NYC or Paris, and its building suspended in the air attached to a nearby hill. This city is a rock and disserve more than a small quick weekend stop over. It won't be my last weekend there, but rather my next move, if I find a job there, maybe ? 28th Floor 1 Peking Road TST. 29th Floor 1 Peking Road TST. Pick up a Tourist Map and Guide (free) at the Airport as soon as you get in. They are strategically placed right before Immigration and also at the baggage claim exits to the Arrivals Halls. An Octopus card is your best friend. The Octopus card is stored-value RFID card that you can use on almost every form of public transport, with the exception of taxis. You can even use them at supermarkets and convenience stores for purchases. You can pick one up at any MTR or KCR station and recharge them at the MCR, KCR, or convenience stores. There is a small deposit to obtain a new card, but the value is fully refundable. Public transportation is world-class. Hong Kong’s public transportation system is ultra-convenient and efficient. Use public transport to reach areas not easily accessible by foot. See list below for types of public transport. Money, money, money. The exchange rate for Hong Kong is HKD7.8 = USD1 (roughly HKD8) or HK10.12 = EUR1 (roughly HKD10). Exchangers are available almost everywhere. Foreign ATM cards also work in Hong Kong. There is no sales tax in Hong Kong. Also, small tips (in the order of a few dollars) are common but not required. Shopping is insane. 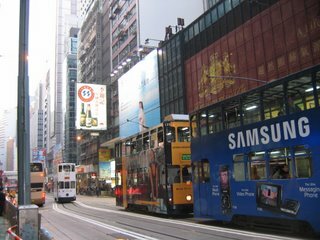 Mong Kok, Tsim Sha Tsui and Causeway Bay are among the best places to shop. “Retail clustering”, where many small shops selling similar products line a particular street, is prominent in several districts. This is great for bargain hunting if you’re a shopper. Also, feel free to try and bargain at the smaller mom & pop stores. Chain stores and department stores are fixed-price. Hong Kong has some amazing vistas. 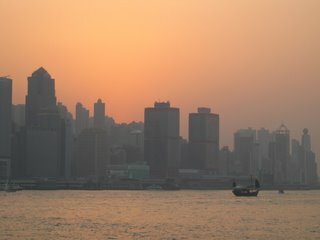 The combination of some of the world’s tallest skyscrapers, green mountains, and expansive ocean make Hong Kong’s skyline and scenic beauty quite amazing (when conditions are good, of course). Make sure you get a chance to view it from the Peak or Tsim Sha Tsui harbourfront. Basic facts. 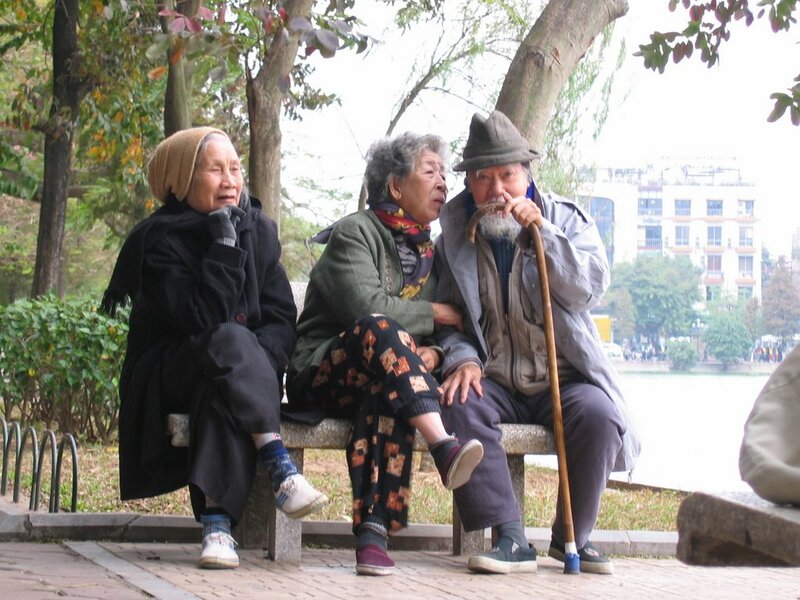 6.8 million people live in Hong Kong, about 95% are Chinese. The official languages are Cantonese and English, with Mandarin growing. 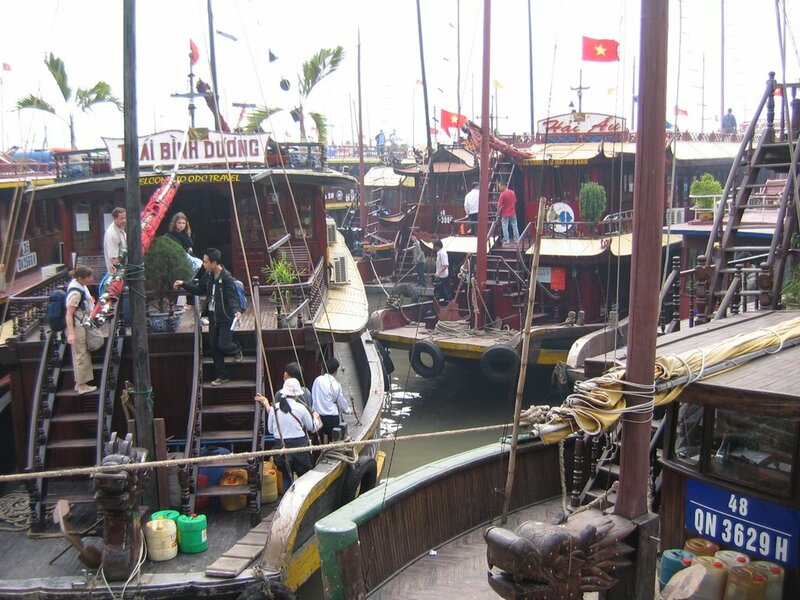 Despite conversion of major public transportation systems to low-emission LPG fuels, air pollution has become an increasing problem in recent years, due primarily to factory output in the northern Guangdong province across the border. Be careful if you’re sensitive to air pollution. Weather. 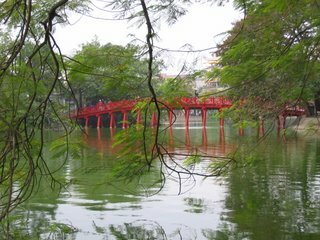 Cool and dry in winter, hot and humid in summer. Airport Express: Links the airport to Kowloon and Hong Kong Island within 30 minutes. A great ride on first arrival to get a nice view of the city. You can also check in your baggage at the Hong Kong and Kowloon Airport Express Stations on the day of your flight, before actually arriving at the airport. MTR: Hong Kong’s advanced and efficient subway system linking Lantau Island, Hong Kong Island, and greater Kowloon. KCR: Hong Kong’s train system which links Kowloon to the New Territories and China. Taxis: Inexpensive and plentiful, fares start at HKD15. Double-decker buses and minibuses: Really cheap and everywhere, fares start at HKD3 or less. Bus route maps are posted at every bus stop. On some of the hilly roads, the rides on these buses gets interesting! Trams: A quick and cheap mode of traditional transport on parts of Hong Kong Island. 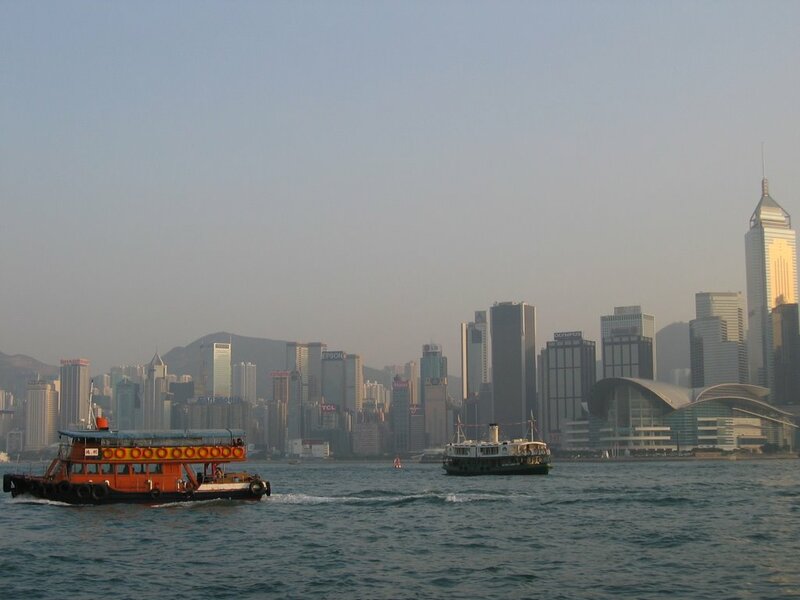 Ferries: These ferries Hong Kong Island to Kowloon and also the dense urban areas to outlying islands like Lantau Island, Lamma Island, and Cheung Chau. 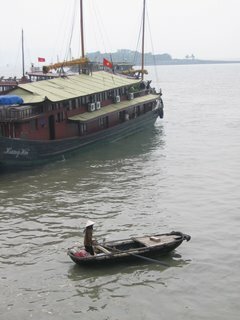 Also, you can take a ferry to Macau which takes a few hours by hydrofoil. Go to The Peak in late afternoon, take the Peak Tram in Central (remember to sit on the right). 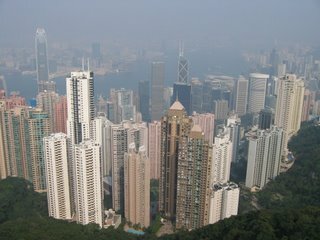 Assuming the conditions are good, you will get an awesome view of Hong Kong from the top (sunset view and night view). Take bus no. 15 to get down from the peak but this time sit on the left on the upper deck. Get off at Central, then go to Lan Kwai Fong for drinks if it is Fri/Sat night. You can't miss LKF on Sat/Fri night after 1100pm! Take a tram ride from Kennedy Town to Happy Valley. Only HKD2 per ride. This route is the shortest and should take you the least time but gives you a good tour of Hong Kong Island. There is also a popular racetrack at Happy Valley. 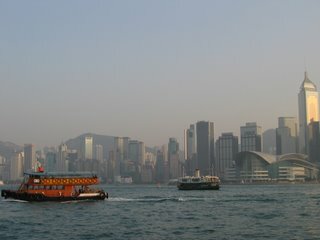 Take the Star Ferry to cross Victoria Harbor, from Central to Tsim Sha Tsui (TST) or vice versa. Try the lower deck. When you get to TST, walk along the seaside walk where you can get a great view of Hong Kong Island. 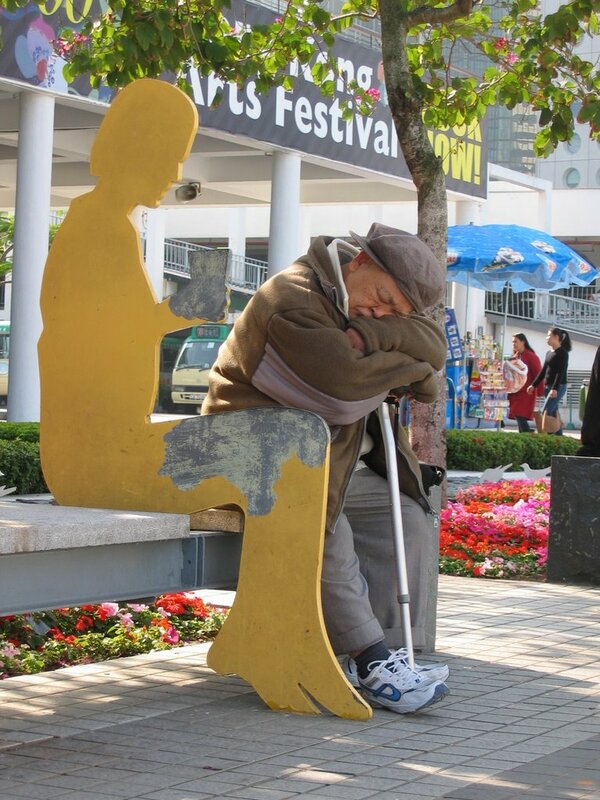 The Avenue of the Stars also lines the seaside walk and is home to a famous statue of Bruce Lee. If you are along the TST harbourfront at 800pm, there will be a lights show. Go to Mong Kok by MTR, go to the Ladies’ Market which bustles the most in the evening. And don’t forget to bargain. On Sat and Sun, it’s one of the most crowded and densely populated urban areas in the world. Mong Kok (and nearby Prince Edward) is home to many examples of “retail clustering” and has a sporting goods street (Fa Yuen St), electronics street (Sai Yeung Choi St), goldfish market (Tung Choi St), bargain fashion street (Fa Yuen St), flower market (Yuen Po St and Flower Market Rd) and bird market (Yuen Po St). Mong Kok is also home to a lot of local restaurants and street food vendors. Don’t be afraid to sample the local cuisine. For the authentic local dimsum experience, try London Restaurant on Nathan Road in Mong Kok, about three blocks south of Argyle St/Nathan Rd. Sai Kung is on the eastern side of the New Territories and is home to a nice seafood market. Take the MTR to Choi Hung and then the minibus labeled “Sai Kung” for an exciting ride through the outlying area. 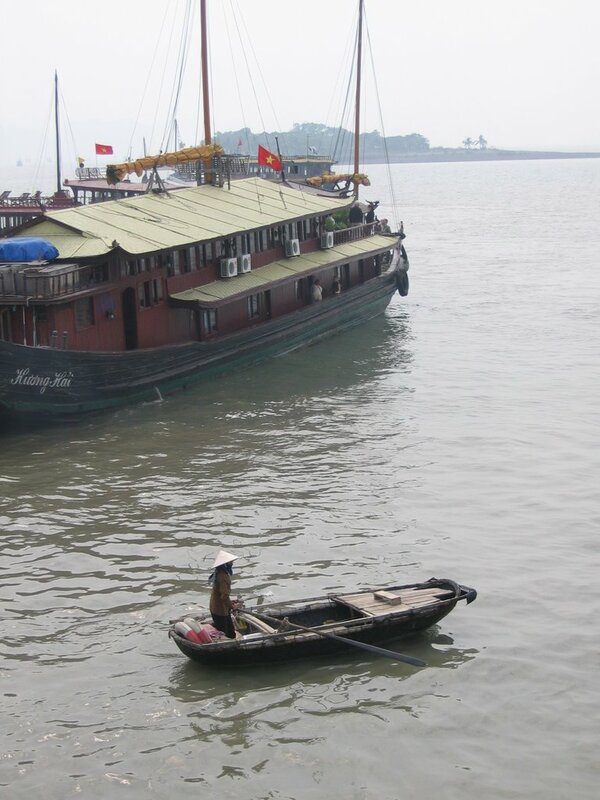 In addition to nice seafood, you can also take boat rides at the pier in Sai Kung. If you like traditional Chinese culture, you may consider sparing half a day to go to Tung Chung. Try visiting the Giant Buddha statue (the biggest outdoor Buddha statue in Asia) and Po Lin Monastery. You can also try taking the new cable car attraction, Ngong Ping 360, though I heard there’s often a long wait since it just opened. If you’re looking for something more peaceful and local, try taking a ferry to Cheung Chau or Lamma Island from Central Ferry Pier. 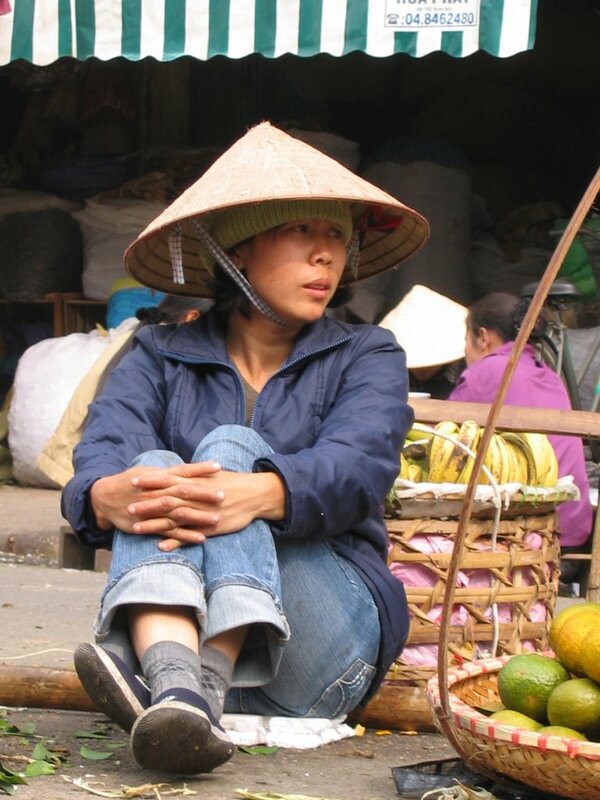 There are temples, beaches, and local seafood restaurants and markets on each island. Here are some pictures, but I will write soon about this great city of Hanoi. Just need a bit of time, thing I don't have anymore in my hands. Where can I buy some ? I will write about Hanoi soon. THIS IS The place to go to in Hanoi. 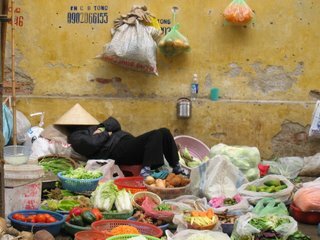 Imagine some street cooking chef all around you in an open square place where you can eat the most delecate food for US$5 per person. 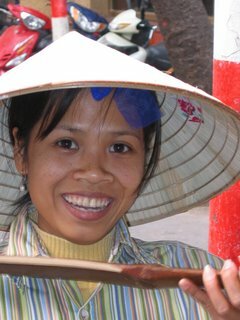 Sea Snail, Baked Osters, Nems, Spring Rolls, Soup, Chicken-on-a-Bamboo-Stick-Rolls .... A MUST GO to eat and see. Impressive and very expensive menu (US$20), but worth going there. 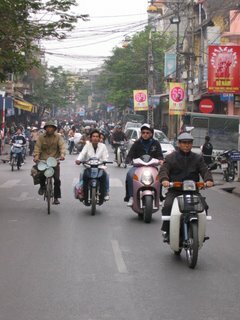 This is a very descent place downtown Hanoi, dorms are cheap and clean. 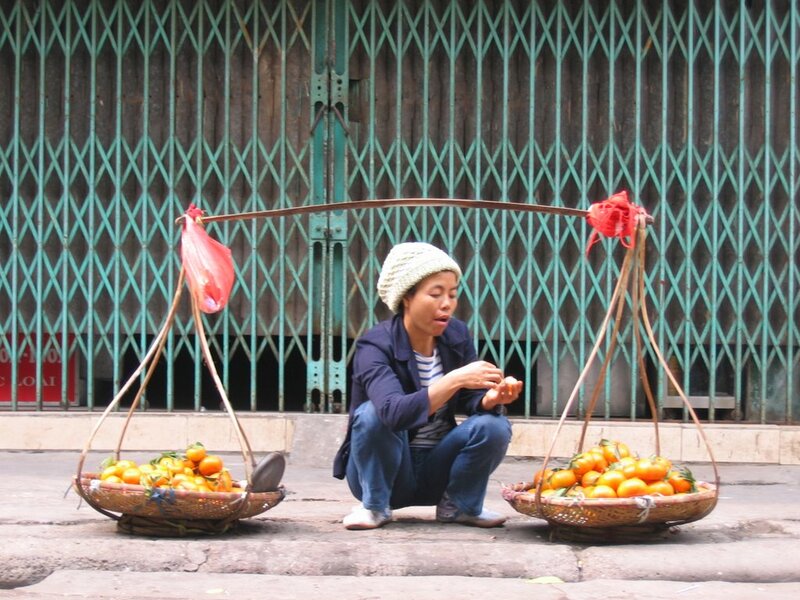 Recommended place, from where you can crowl around the old part of Hanoi. Good english touring guides as well. They can organize Airport pick up as well for you. This is an amazing site on the planet that deserved to be sailed around once in your life. Imagine thousands green islands spotting out a calm grey sea. Only the sound of your engine comes along you and Mother Nature ... It did not start that way though. Our small group of travelers (16 all together) planned to spend NYE on the ocean, and we booked our 3 days Ha Long Bay tours with Saigon Travel Cafe in Hanoi. We were not the only ones who planed that. We were thousands of tourists to have the exact same idea. 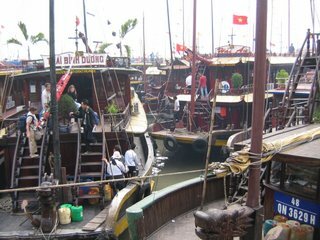 When we arrived after 3 hours bus drive on the North Vietnamese Highway (a story on itself), we were literally hundreds of boats trying to leave the only pier at the same time. We heard crash, noises but never yelling at each other. Our junk was smashed by a bigger one, but we did not sink. Finally we reached a safe spot from where we could take off to the bay. 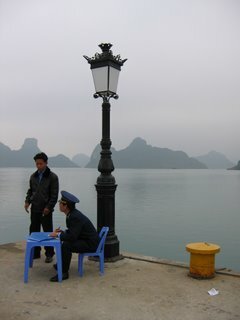 At first we could not see a thing, but the mist disappeared chunk by chunk and we discovered the space around and the hundreds boats around us. It was a compilation of small tiny drop of land on a quiet ocean of water. From time to time we could see a dinky floating between the different magical elements. We crawled quietly till the final destination doing some tourist activities like dress-down kayaking, cave visiting, pictures taking or shrimps eating. We reached New Year Eves climbing a imported Red Label and some exotic Smorniff. The twelve sounds were celebrated by a Manchester Vs Paris dive in the bay. Who won? Who cares! 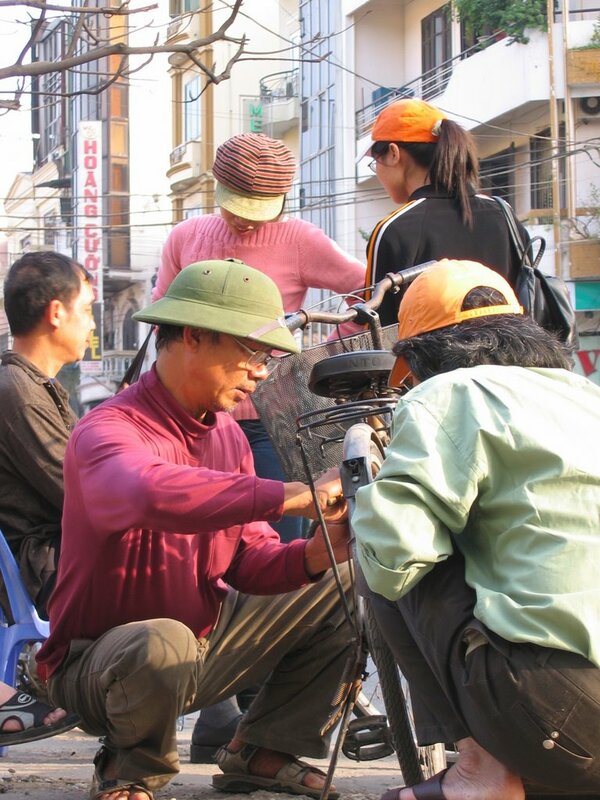 Quand our guide (King or Flower in English) did something amazing which was for me the beginning of my take off to Vietnam land, he sang a song from the country side telling the story of people going to the city and missing their own town. This languorous song was perfectly setup among the dark night and the shooting stars. I closed my eyes and dreamed for some time. 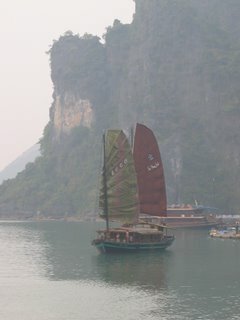 The next day we visited the main Cat Ba Island, which was the center of resistance of the North Vietnam during the war. We talked a bit of the war and saw some excavations, some history, did some trekking too early for me anyway. Starting a 2 hours trek at 10 Am on Jan 1st !!! Talk about new years resolution ! Next year I make none for sure. 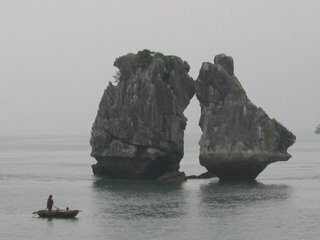 Ha Long Bay is magic, and deserved to be seen under a blue sky, like the moon I guess. 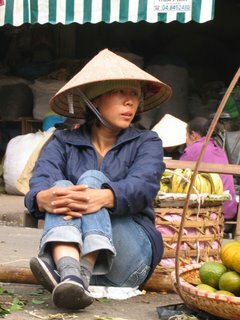 In order to wait a bit for the Vietnam trip reports here are some pictures.